Victoria, BC – 31 athletes, between the ages of 15-22, tested their capacity for sport performance at its highest level as part of the Canadian Sport Institute Pacific’s third annual PODIUM SEARCH™ on Sunday, May 25. PODIUM SEARCH™ is a FREE half-day athlete identification camp designed to test athletes’ capacity for sport performance at its highest level. Each athlete completed a set of basic physiological tests plus sport-specific tests conducted by world-class sport performance experts in order to observe how they measure up to National Team standards. 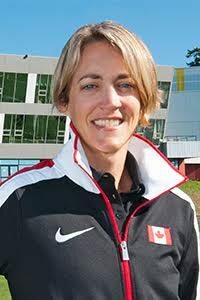 In addition to the testing events, athletes heard an inspirational address from keynote speaker Christine Girard, 2012 Olympic bronze medallist in weightlifting. “2014 is our third year of hosting these athlete identification events, and over the past two years we have tested 160 athletes against National / Provincial sport organization protocols and identified 13 athletes who have what it takes” said Kurt Innes, Director of Talent Development with the Canadian Sport Institute Pacific, Olympic track cyclist (1992), and Olympic cycling coach (2000, 2004). In 2013, three athletes identified at PODIUM SEARCH™ transitioned full-time into Canadian Sport Institute Talent Development Programs (TDPs), two in cycling, and one in para-rowing. Athletes who participated in PODIUM SEARCH™ will be evaluated for possible selection for Canadian Sport Institute Pacific’s Sport Programs based on their test scores during the camp. They may also be invited to join the Canadian Sport School. The next PODIUM SEARCH™ takes place on May 31 at 8:00 am at the Richmond Olympic Oval.